I’m sitting in the Mabul Cafe, a cheerfully lit restaurant overlooking Semporna’s harborside drag that boasts mediocre food and sluggish service. I’m here only because it’s the only place in town with decent WiFi internet connection. 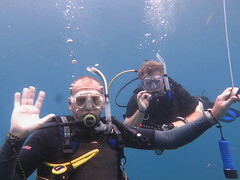 The tourism industry – all dive-based – has taken off in the past few years. Suddenly scores of salty-haired white people in board shorts visit the local shops, seeking scarce fresh vegetables or sun cream or mosquito repellent that actually works. The locals seem to still be bewildered by us and our questionable morals: There’s a sign in the Scuba Junkie shop, entitled “Boobie’s and Bums,” that asks female patrons to please cover their bikini tops and bottoms when they leave the premises. It’s nearly impossible to get any alcohol here – Sabah’s population is predominantly Muslim – so there’s an illegal-but-tolerated trade in cheap rum, gin and beer smuggled in from nearby Philippines. It’s all very 17th-century pirate-y. There are two bars in town, both attached to dive shops. Tuesdays and Fridays are the Big Nights at Scuba Junkie’s bar, because that’s when the band plays: Five remarkably gifted local musicians play covers from The Eagles, Nirvana, Metallica, and everything in between. In the evenings the local young people cruise around in their tricked-out cars, deafening pedestrians with dance music and hip-hop blaring from their stereos. About half the women wear head scarves – some with chaste long skirts and others with tight jeans. Packs of pre-adolescent street urchins troll the garbage bins seeking large plastic water bottles, which they sell to fish farmers for 3 ringgit per kilo. Once a kid must have hit the jackpot, because he yelped with glee and called to his friends, to hurried over to help gather the treasure which he had unceremoniously dumped from the bin into the street. Yes, Semporna is a classic filthy harbor town: the stink from the festering harbor mingles with the scent of fresh fish and gently rotting fruit from the market. But the tourist money seems to be having some effect, judging by the shiny new cars and monster pickups driven by many of the older locals. It’s a town about to boom – they’re building two new malls/markets near the harbor, which is where all the tourists huddle, mostly afraid to venture into the scruffy main part of town. Despite its lack of charm, though, there’s something about Semporna that I like. I like that the town has yet to give itself over as a fancy tourist destination – there’s only one marginally upmarket hotel in town. 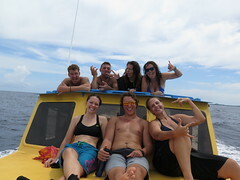 The richer divers attracted by the spectacular diving all stay at the resorts on Mabul and Kapalai, two nearby islands surrounded by coral reef. OK, that’s all on Semporna for now. More about my own life here…coming soon! I would definitely recommend the diving here. Semporna isn’t the prettiest place you’ve ever been, but who cares if you’re diving all day! I’ve been here for more than a month, and I’m not sick of the diving yet. If you want to go to Sipadan, you should try booking now – the permits go *fast*. If Scuba Junkie doesn’t have any Sipadan permits available you can also try Borneo Divers, Uncle Chang’s or Big John Scuba. 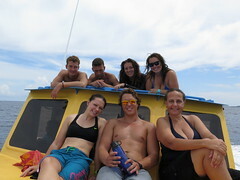 But even if you don’t go to Sipadan, the diving around Mabul/Kapalai is great. VÃ¤ldigt bra motiv och vinkling pÃ¥ ditt exempel, snyggt och iÃafangoll¶nde ocksÃ¥.Jo, jag vill bara sÃ¤ga att jag vill vara utom tÃ¤vlan, sÃ¥ besparar jag dig den mÃ¶dan. Jag har sett sÃ¥ mÃ¥nga bra bilder hÃ¤r som Ã¤r bÃ¤ttre att bli nominerade Ã¤n jag.Hade.